If you have any more information or have any question about our blogs disclaimer, please fell free to contact us by email at GSMNepalZone.blogspot.com or Sujan.nepal.568@gmail.com. The information on this web blog is published in good manner and for general information purpose only. 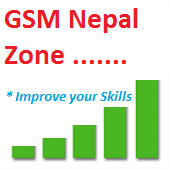 GSMNepalZone does not make any warranties about the completeness.The information publish in our blog web correct in field but it depends on your working abilities. Any action you take upon the information you find on this web blog (GSMNepalZone.blogspot.com), is strictly on your own risk. GSMNepalZone.blogspot.com will not be burden for any looses, breaks and/or damage in connecting with the use of our web blog. From our web blog, you can visit another websites by following hyperlinks to such external sites.while to provide any quality links to useful and sites.we have not fully control over the nature of the web blog.That blog owner can change content and delete posts without notice and may occur before we have the opportunity to remove a link which is dead. Please be also aware that when you leave our web blog,other sites have different private policies and terms which are beyond our control.Please be sure about the other sites " terms and condition " . By using our web blog.You have to consent to our disclaimer and agree to its terms and condition. We should update or make any changes to this document,those changes will be prominently posted on the web blog.